We’d love your help. Let us know what’s wrong with this preview of The End of Science by John Horgan. To ask other readers questions about The End of Science, please sign up. A very simple criticism of his thesis is that before quantum theory, there was only chemistry etc. There were large swathes of nature that still couldn't be explained coherently then, just as there are now. In biology we have certainly established basic principles are and research is likely to be asymptotic. The same can't be said of physics. There is a lot we don't know about nature, and as long as there are things we can't explain, there wi be a possibility that we may one day explain it. Imagine this guy was writing a book like this in Newton's time. His analysis of the sociology of scientists is compelling but a bit warped. Saying that scientists are delusional about their hopes about the future just because they are optimistic about the idea that the best years of science are ahead is a lame criticism. Everyone has hopes and dreams about the future with elements that are not extant in our present time. Criticisms against him, that this book is just another 'end of' book, are right. There is nothing particularly special about our era of science or society. We are about as special as any civillisation in the past. Postmodernist views of science all in all seem compelling to me. We only have a superficial contact with physical reality, and most observable things are limited by our senses and intuitions as well as physical instruments based on our physics, a physics we have constructed in our minds. There is nothing to say that in the future, we can't change our minds about this physics, and gain more sophisticated theories and more sophisticated instruments. There is nothing to say that the state of physics today is as far as we will get. In fact, this idea is absolutely ridiculous. I think many scientists would agree that their object is not truth, but truth-seeking. I don't think much more should be said about it. It would be nice to discover more about the world, and there aren't any real limitations like what Horgan proposes. But I think many of us are content with the notion that we born and we die. Some of us like science because it is knowledge that accretes, which is something that is not going to stop happening. Fundamental discoveries or not, science is wrapped up in the idea that there are interesting questions we can hope to answer. Why is that not enough? Why is this delusional? There ARE interesting qns, fundamental qns, that may yet be answered through science. In fact, it is delusional to assert otherwise, which was the major affront of this book. "6.52 We feel that when all possible scientific questions have been answered, the problems of life remain completely untouched. Of course there are no questions left, and this in itself is the answer." and therefore we should turn to God to validate our existence. Of course, this is a matter of perspective, and I disagree with both the premises and the conclusion. At first I was excited to read this, as Horgan is able to write complex ideas clearly, but then about 1/3 into the book I got what he was doing. I found him disingenuous in how he presents these scientists, almost as caricatures. Much of his "take" on their theories are variated with rhetorical questions, and judgements that seek only to influence the reader into seeing that science may have a limit. This may be needed to shake people from their firm belief in science, but the way Horgan goes abo At first I was excited to read this, as Horgan is able to write complex ideas clearly, but then about 1/3 into the book I got what he was doing. I found him disingenuous in how he presents these scientists, almost as caricatures. Much of his "take" on their theories are variated with rhetorical questions, and judgements that seek only to influence the reader into seeing that science may have a limit. This may be needed to shake people from their firm belief in science, but the way Horgan goes about doing so is melodramatic and without integrity. For example, he will criticize standard theory in physics saying something like how the field is only 20 years old, and we haven't made any progress! (hinting that there is something wrong with the theory) but then a few pages later he will say something like how black holes have only been discovered for 20 years, the field is too new to say anything meaningful yet. Not exactly a contradiction but you see what I am saying; the judgements he cuts into the text about the scientists themselves, or about their theories or presentation is less than honest. He seeks to make us uncertain about everything in his own book so we can feel that well, maybe this science is crappy or misguided in some way. This purely rhetorical way of attacking content given in good faith by interviewees is disgusting. For a book about complex ideas, there is some kind of philosophical naivete here, where we have expectations of progress that can be verified in some objective way. If Horgan was more honest, he would establish criteria in the book for what progress is, and how science can be measured as to "living up to" its potential. But he doesn't do this... although some of the interviewees do talk about this kind of criteria, Horgan seems more interested in finding their person odd than exploring their ideas. "Humanity, Nietzsche told us, is just a stepping stone, a bridge leading to the Superman. If Nietzsche were alive today, he would surely entertain the notion that the Superman might be made not of flesh and blood, but of silicon. As human science wanes, those who hope that the quest for knowledge will continue must put their faith not in Homo sapiens, but in intelligent machines. Only machines can overcome our physical and cognitive weaknesses -- and our indifference." And I must admit that his argument that *human* science is waning is quite compelling. But he constantly confuses the waning of human science with the waning of science in general. Horgan seems to oscillate between a conviction that we know almost everything there is to know, that all that remains for science is to fill in the little details, and a conviction that humans are just too stupid or disinterested to continue with scientific exploration. One of my biggest qualms with this book was the ending. Horgan, who had until that point presented himself as a thoroughgoing monist, rationalist, and skeptic, does a double take and suddenly spouts a sort of mysticism totally detached from anything seen beforehand in the book. He even ends with an argument that once there is nothing else to discover, we must turn back to believing in God since we need something to believe in. That was a bit disappointing. A senior editor at Scientific American interviews a bunch of celebrity scientists and philosophers of science, and tries to get their opinion on the thesis that science is about to end, which is to say we already know everything we can know within practical limits - we would learn a great deal about particle physics if we could construct a 1000-light-years-long particle accelerator, but we can't, so we won't. Unfortunately, this editor himself has no training in science, and so he is unqualified A senior editor at Scientific American interviews a bunch of celebrity scientists and philosophers of science, and tries to get their opinion on the thesis that science is about to end, which is to say we already know everything we can know within practical limits - we would learn a great deal about particle physics if we could construct a 1000-light-years-long particle accelerator, but we can't, so we won't. Unfortunately, this editor himself has no training in science, and so he is unqualified to critically present his respondents' answers. I am embarrassed to make a fool of myself in front of 100 bloggers when I make assertions about areas of science I don't completely understand; apparently John Horgan is not embarrassed to do it in front of what-is-the-print-run-of-the-book? 10000 readers? Originally published on my blog here in October 1999. John Horgan originally set out to write a book of profiles of the most eminent scientists of the late twentieth century, based on interviews he had carried out as a journalist for Scientific American. But he became fascinated by a theme he perceived in these interviews, the question of whether we might have almost reached the end of what science can discover about the universe. The first thing he has to do is to define the various ways in which Originally published on my blog here in October 1999. There may be theoretical limits on what can be known, a physical equivalent of Gödel's Incompleteness Theorem. The problem with this is that attempts to apply this mathematical result to science are never very convincing, as Horgan points out. He goes on to argue for this point of view in certain branches of science, where the major theories discussed are not empirically testable. This is clearly the case in historical fields of study, such as cosmology and evolutionary biology, where we cannot prove that any particular theories of the origins of the universe and of life are wholly correct, because these were one off events (as far as we know) in the distant past. All we can do is see if the theories we have come up with match up with what we see around us now (the microwave background and the distribution of matter, the fossil record and Earth's ecosystems). There may be limitations affecting science in general, if a final "theory of everything" is discovered. Then there would be no more fundamental revolutions to come in science; it would only be a matter of filling in the details. This is the attitude that nineteenth century scientists are accused of holding, though (again as Horgan points out) historical investigations have tended to disprove specific allegations (Kelvin's supposed speech in which he said that all that there was left to do was to discover physical constants to more decimal places; the patent office official who resigned because nothing was left to be discovered). There is of course the possibility that a revolutionary new discovery will be made, a new theory will be proposed, but even today, Horgan says, the evidence is against it. There has been a dearth of revolutionary ideas since the sixties; most of theoretical science since then has continued steady development of those of the first half of the century (relativity, quantum mechanics, subatomic structure, the synthesis of Mendelian genetics with Darwinian evolution) or from that decade (DNA, the standard model, the Big Bang). Theories currently touted as the next revolution (such as superstrings and various inflation scenarios) contain ideas that may be inherently untestable. This means that we may be moving into an era of what Horgan calls "ironic science", a term borrowed by analogy from Harold Bloom's The Anxiety of Influence, an analysis of poetry in the seventies. Lacking new discoveries to make, scientists move away from traditional science to reinterpret older theories and to discuss metascience. In other words, science loses its independent existence and becomes part of philosophy once again. The third reason that science may end is that we no longer have the power to invent deeper theories; science becomes beyond human cognitive abilities. There is, after all, no obvious reason why human beings should be able to grasp the universe of which they form part; in fact, the vastness of the universe by comparison with our minds makes it unlikely. The universe is a complex object; why should it be governed by a simple set of rules? Evidence for this point of view comes from the difficulty of grasping current ideas, increasing specialisation and the length of time needed for becoming a fully fledged researcher in a modern scientific discipline. The fourth reason is more mundane: scientific research is becoming too expensive. Governments, always parsimonious towards pure research, have become even more so since the end of the Cold War. Projects like the Superconducting Super Collider have failed to receive funding because the cost is perceived to outweigh the benefits, and the propaganda value gained from big science projects is less (would the US fund a moon programme today with the same urgency as granted the Apollo project?). In fields like particle physics, bigger and bigger experiments are needed if more fundamental discoveries are to be made, and even then there is no guarantee that they will be made (much of the last twenty years has been spent just confirming the details of the standard model rather than advancing any further). And then applications are not at all obvious; we may not be able to do exciting new things as a result of these experiments, and without applications (results, so far as governments and corporations are concerned), no one is going to fund the research. The first three reasons are interesting philosophical speculations, but it is the fourth that is in my opinion most likely to bring an end to the scientific search for meaning in the universe. The scientific establishment has naturally attacked Horgan's book, because it is negative about the future of science. Yet we live in a world where science is still to some extent seen as the universal panacea that will bring enlightenment and truth, and eliminate all evils (even though some of these evils, such as pollution, are consequences of earlier scientific 'advances'). In this environment, a negative voice is perhaps a good thing; nobody is attacking science strongly enough to destroy public confidence in it in the way that scientific blunders are doing (through food scares like the BSE crisis, for example). There is a tendency towards arrogance among successful scientists, and many could do with thinking a little harder about what they are doing. 1. As science solves the low-hanging fruit, the cost of research rises exponentially and becomes impossible to justify. 2. There are often perceptual barriers innate in being human that prevent us from either seeing the problem well enough to understand it, like researching our own consciousness, or act as hard limits to prevent empirical verification, like universal distances in astronomy. 3. The lack of empirical verification tends to lead to what he calls ironic science: elegant theories which are closer to theology than scientific fact. String theory, for example. Song and dance from start to finish. If Horgan were serious, then this book would evidence only a lack of imagination. But one or two passages, unless plagiarized, suggest that the author is sufficiently knowledgeable and intelligent that he can hardly be thought to believe what he proposes. True, he quotes scientists whose statements appear to support his view, but he must have omitted everything and everyone else who might suggest otherwise. There is a story, untrue, that somone suggested a hun Song and dance from start to finish. If Horgan were serious, then this book would evidence only a lack of imagination. But one or two passages, unless plagiarized, suggest that the author is sufficiently knowledgeable and intelligent that he can hardly be thought to believe what he proposes. True, he quotes scientists whose statements appear to support his view, but he must have omitted everything and everyone else who might suggest otherwise. Un libro la cui idea di fondo meriterebbe 5 stelle ma che se ne aggiudica 4 a causa dei commenti tendenziosi dell'autore volti a screditare oltremodo i lavori degli scienziati che lui definirebbe "forti". Peccato non poter leggere il libro di Gunther Stent "The Coming of the Golden Age" cui l'autore attribuisce i meriti dell'idea alla base del libro, in quanto non è stato tradotto in italiano. I can't recall another book that advanced an argument I so disagreed with but found fascinating and informative anyway. Horgan stands in a long line of figures who have asserted an "end of science," though he handles his argument in a manner that doesn't distract from the meat of the book, which is the interviews with philosophers and scientists. For many, the structure of the book will probably seem hodgepodge or scatter-shot. I found this to be an entertaining delivery, though -- as if you were I can't recall another book that advanced an argument I so disagreed with but found fascinating and informative anyway. Horgan stands in a long line of figures who have asserted an "end of science," though he handles his argument in a manner that doesn't distract from the meat of the book, which is the interviews with philosophers and scientists. For many, the structure of the book will probably seem hodgepodge or scatter-shot. I found this to be an entertaining delivery, though -- as if you were suddenly thrust into a room filled with the big names of some of the century's major scientific debates, each one taking a brief opportunity to ramble, despair, or pitch their own Big Idea. Having worked in the lab and field myself, I know science is very much a human enterprise. If you spend time around scientists or read about their lives, I think you'll find that their life experiences and personalities very much shine through in their work. Horgan captures this incredibly well with a certain je ne sais quoi that is characteristic of much of his writing. I get the sense that the "end of science" theme in the book was bigged up just a bit for commercial purposes ("The Probable Decline in the Rate of Scientific Discovery" wouldn't sell as well). I definitely agree that we are seeing diminishing returns in certain fields and that the complexity of our knowledge has grown to the point that the days of the lone inventor and garage tinkerer are over when it comes to major discoveries. His characterization of a certain postmodern sensibility he calls "ironic science" is astute. However, some of his own examples run counter to his argument. Neuroscience, a field just coming out of its infancy, still has much to discover about the brain and cognition, though I did still enjoy the chapter on it. Nevertheless, I don't feel that the faults in the argument detract from the book all that much as Horgan seems mostly content to let his interviewees do much of the talking. I first encountered this book a couple years ago when I was, as I always am, wandering around in my favorite bookshop to occupy my free time and help out customers - most of which are to this day still firmly convinced I work there. Anyway at the time I found it expensive and far too pretentiously titled (also the Italian edition - beautifully elegant but serious nonetheless - with its non-figurative red cover kind of frightened me) so I put it back on the shelf and forgot all about it. A couple I first encountered this book a couple years ago when I was, as I always am, wandering around in my favorite bookshop to occupy my free time and help out customers - most of which are to this day still firmly convinced I work there. Anyway at the time I found it expensive and far too pretentiously titled (also the Italian edition - beautifully elegant but serious nonetheless - with its non-figurative red cover kind of frightened me) so I put it back on the shelf and forgot all about it. A couple weeks ago I happened to be in a bookshop sale and found it again, still kind of pompous looking but with the red cover a little bleached out because of the wear and the significantly lower price; the former hesitancy immidiately turned into compassion for the abandoned book and I decided to give it a try. Horgan's thesis is that science might have reached in the last century its climax and therefore have little left in store for scientists. In the book he argues that there could not - and won't - be any discoveries comparable to that of quantum mechanics or Einstein's relativity. 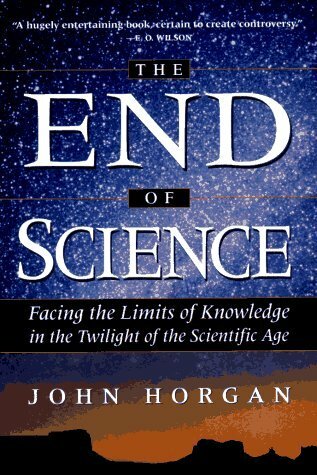 As a journalist Horgan happened to interview a great deal of influent scientists so he thought of putting those interviews together in this book which is divided in chapters named after each scientific field the interviewed people deal with - all of which follow the scary verdict "the end of". I have to say, I was too fast judging this book: I found it rather interesting and insightful. Don't misunderstand me, I'm no expert - so that could be partly why - but I enjoyed it a great deal. Horgan's writing is fluent and not a bit dull (as I pictured it to be from the non-figurative red cover). Also I really liked the fact that each time he gave a full description of the person - scientist - he was interviewing so that it was easier for me to picture him/her from more than what they were saying. The End of Science is about the end of new discoveries in scientific fields more than it's about the end of science as a method of discovery. It discusses many different reasons why scientific discoveries may be harder to make in the future, but the most important one mentioned is that science has been so successful. It's discovered all of the low hanging fruit, and the author claims that we've entered into an era of diminishing returns on investment into scientific investigations. The book is fu The End of Science is about the end of new discoveries in scientific fields more than it's about the end of science as a method of discovery. It discusses many different reasons why scientific discoveries may be harder to make in the future, but the most important one mentioned is that science has been so successful. It's discovered all of the low hanging fruit, and the author claims that we've entered into an era of diminishing returns on investment into scientific investigations. The book is full of interviews the author did with various scientists and philosophers. Many of those interviews took place well after the interviewee did their most famous work. Often, the book compares two different types of scientist in a given field: one who feels that the topic is about solve all of its problems, and another who feels that the topic has fundamentally unanswerable questions. There are a lot of speculative psychoanalyses of various scientists in the book, and many are described as "scared of success". The book doesn't claim that the end of science is necessarily bad, just that it's happening. It does claim that many of the un-testable theories currently in vogue are not science as it used to be practiced. The value of these un-testable theories, according to the book, is that they inspire in people a sense of wonder, and a sense that science isn't settled law. Much of the book seems to argue that if we figure everything out, life will in some way be less worth living. I don't agree with that at all. It's hard to argue with either of these. Maybe we will need to replace the standard model to account for dark matter; but that replacement will contain the standard model. QM and GR need to be married, but that marriage will contain QM and GR. Will either of these things be as revolutionary as their predecessors? Horgan argues no, based on some faith and a bit of argument. I'm not so sure, but there is a strong possibility he is right. Nonetheless, science may be limited in many ways, few of which are ever discussed in pop-science books. This book tries to do that... but fails to be convincing on several fronts. The first is that while I share some of Horgan's sense of, "Well, this is just BS," in regards to some popular theories/areas/subjects, he doesn't argue that these areas are non-productive so much as he argues that the people promoting/researching in them are "ironic scientists." He also, it seems, caricatures or even... cherry picks... to make his point. (That is my impression; not a fact.) Additionally, he fails to discuss whether the cruft around the edges is normal. Perhaps there is always a certain amount of BS swirling about the edges of 'real' science; perhaps 'ironic' science isn't new or unusual or significant. I think it's easy to forget all the ideas, good and bad and 'not even wrong', left on history's cutting room floor. Third, even if his point is valid, I'm not sure it's quite the existential crisis he makes it out to be. E.g. terraforming Mars is 'mere engineering', but I'm sure it would absorb a lot of the mental 'spare cycles' of those so inclined. He mentions and kind of dismisses lifespan extension... as if this wouldn't be earth shattering to scientists and lay persons alike, even if not as fundamental in some pure, Platonic sense as e.g. General Relativity. This book did not age well. Written in the early 90s by John Horgan (for context, he's a journalist, and mainly penned pieces for 'Scientific American'), it's desperately trying to convince you that science, as most of us know it, has burnt out and, well, has nothing more to discover. I beg to differ. And I beg to differ with its style. He's American, so he naturally thinks the world revolves around him and his ideas. He's also white, and a man. And this was written in a time where basically tryin This book did not age well. He's American, so he naturally thinks the world revolves around him and his ideas. He's also white, and a man. And this was written in a time where basically trying to portray your interviewees as caricatures was acceptable. So yeah, the premise is 'if I disagree with them, I'm gonna slander them'. And that's what he does for 300 or so pages. His depiction of Popper is less than flattering, and so's the one of Kuhn (as a funny aside, the way he describes the interview is a frustrated Kuhn constantly going 'you're not getting this', him saying 'no, I understand' and then missing the point completely). 3* - kao aritmetička sredina između 2 i 4. Ova knjiga zaslužuje 4* kao zanimljiv prikaz kako već prihvaćenih teorija, tako i alternativnih ili divlje spekulativnih te kao prikaz (ne)postojećih granica znanosti. S druge strane, zaslužuje 2* zbog karikaturalnog i podcjenjivačkog portretiranja sugovornika i njihovih stavova. Overall agree with his thesis (at some point our technological development will hurt diminishing returns and we'll plateau), but given the nature of the book you think he'd put more energy into updating it for new editions, but his examples were all still drawn from the 90s. This would be a good book for someone interested in the topic. A few chapters were great such as the chapter announcing “The End of “Chaoplexity,” which contains a section about the limits of computer simulations used by global warming proponents. I didn’t like the way he portrayed scientists, in aggregate, as curmudgeons. The end of science, or the Star Trek Factor? In “The end of science” John Horgan is pursuing provocative questions. Has science been entered an era of diminishing returns? Is physics moving towards absolute truth? Would be able physicists to prove a final theory in the same way that mathematicians prove theorems? John Horgan’s thesis is that we are coming to an era where all the fundamental scientific theories have been discovered and science as we know it today is coming altogether in an end. Horgan The end of science, or the Star Trek Factor? John Horgan’s thesis is that we are coming to an era where all the fundamental scientific theories have been discovered and science as we know it today is coming altogether in an end. Horgan considers fundamental, theories such as Darwin’s natural selection, Einstein’s general relativity and quantum electrodynamics. That means theories that can apply, to the best of our knowledge, throughout the entire universe at all times since its birth. In order to prove his thesis, Horgan has interviewed interesting scientists and philosophers from the entire scientific and social-philosophical landscape. Roger Penrose, Noam Chomsky, Thomas Kuhn, Paul Feyerabend, Freeman Dyson, Stephen Jay Gould, Carl Popper, David Bohm, Edward Wilson, John Wheeler, Lynn Margulis, Andrei Linde, Daniel Dennet and many others. I must say that I disagree with Horgan’s argument and I find his view very shortsighted. Horgan is not the first or the last person to argue over the-end-of-science-era. At the end of the nineteen century, physicists also thought they knew everything. But only two decades later Einstein and other physicists discovered relativity theory and quantum mechanics. These theories transformed physics and opened up vast new vistas for modern physics and other branches of science. The end-of-science argument and timing (millennium and link with Fucuyama’s End of History) have caused wide-range and “confusing” reactions and responses form science critics, scientists themselves, and even from Clinton’s Science Advisor who publicly repudiated Horgan’s argument. We can safely say that it is a discussion/debate that still goes on. In my personal opinion the value of the book is not in the message and if we are/ or not denouncing it. Horgan is a science journalist with an education in literature. I think, his background makes the difference in the way he writes about science. With his prose style, he manages to fill gaps that other science writers fail to do, and make scientific writing an interesting adventure. He has the gift not only to make scientific theories understandable for the non-scientists readers but also to reveal beautifully his interviewee’s personalities. These interviews, the presentation of scientists as human beings, are the most interesting insight for me in the book. Reading the book I had the feeling that Horgan tried to construct a psychological and ideological profile of each one person and it was fascinating to “discover” the eccentricities of the scientists who invented?/developed? some of the most interesting scientific and philosophical theories in the 20th century. As for the end of science? As a scientist I am optimistic. The best in science are still to come. But my view (as a Star Trek fun) is possibly distorted by what Horgan call in his book (p.244-245) the Star Trek factor. Yang menjadi poin penting mengapa buku ini enak sekali dibaca adalah sarkasme ala jurnalis Pak Horgan kala mewawancarai para narasumbernya. Rasanya ia tak punya posisi pasti dalam menyikapi premis utama buku: "the end of sicence." Di saat ia mewawancarai para saintis yang optimis dan percaya pada kelanggengan sains sebagai "tool of trade" manusia untuk mencari tahu kebenaran, ia akan bersikap ironis dan skeptis. Sebaliknya di saat is mewawancarai mereka yang pesimis, ia akan bersikap ofensif den Yang menjadi poin penting mengapa buku ini enak sekali dibaca adalah sarkasme ala jurnalis Pak Horgan kala mewawancarai para narasumbernya. Rasanya ia tak punya posisi pasti dalam menyikapi premis utama buku: "the end of sicence." Di saat ia mewawancarai para saintis yang optimis dan percaya pada kelanggengan sains sebagai "tool of trade" manusia untuk mencari tahu kebenaran, ia akan bersikap ironis dan skeptis. Sebaliknya di saat is mewawancarai mereka yang pesimis, ia akan bersikap ofensif dengan membawa gagasan optimis mengenai sains progresif yang bisa membawa umat ke masa depan yang penuh pencerahan. Started out great and then ended okay. This is really a book on philosophy of science, not science. Toward the end, it felt like a bunch of ramblings by scientists, half of which I’ve never even heard of. Great early interviews of those I have heard of though, Richard Dawkins, Karl Popper, Francis Crick, etc. Many of the later interviews seemed like a hodgepodge of musings by scientists; some interesting, some not so interesting. The book seemed to fall apart toward the end, as many of the scien Started out great and then ended okay. This is really a book on philosophy of science, not science. Toward the end, it felt like a bunch of ramblings by scientists, half of which I’ve never even heard of. Great early interviews of those I have heard of though, Richard Dawkins, Karl Popper, Francis Crick, etc. Many of the later interviews seemed like a hodgepodge of musings by scientists; some interesting, some not so interesting. The book seemed to fall apart toward the end, as many of the scientists and even Horgan himself became almost incoherent. After starting out so great, it's too bad he didn’t end the book 100 pages early. As far as the main argument of the book is concerned, I guess I am somewhat convinced, but I’m not really sure “end” was that well defined. The definition kept changing as scientists talked with Horgan. I’m more impressed with his access to this group of scientists than the book itself, although I’m always impressed with his skills as a science writer. The fact that the book is almost 15 years old didn’t help either. This book has a fascinating premise and moments of great humor. John Horgan interviews many great contemporary scientists in an effort to discovery whether the age of relentless scientific progress is drawing to an end. It's uncomfortable to imagine that their are no new fundamental laws or theories for scientists to discover--nothing on par with the Big Bang Theory or Darwinian biology on the horizon. Being one of the types who could accept ironic science on its own merits; I think Horgan is wr This book has a fascinating premise and moments of great humor. John Horgan interviews many great contemporary scientists in an effort to discovery whether the age of relentless scientific progress is drawing to an end. It's uncomfortable to imagine that their are no new fundamental laws or theories for scientists to discover--nothing on par with the Big Bang Theory or Darwinian biology on the horizon. Being one of the types who could accept ironic science on its own merits; I think Horgan is wrong in assuming that the future of science will be detailed oriented only, but he does a good job of making that argument. Although primarily a vehicle for Horgan’s belief that science, with Darwin and Einstein behind us, has reached the point of diminishing returns and is now made up in large part of “ironic” studies, the book’s main fascination is the broad overview it presents of the way science is perceived by many of today’s prominent practitioners. Very absorbing stuff, and Horgan’s thesis is very persuasive. In fact, I think it’s permanently colored my view of the science timeline. This book reveals the bankruptcy of the ideas of scientists who wax philosopical without an understanding of the philosophical basis of science; their themes frequently contradicting it. While the author points out some of these weaknesses, his positions also lack cogency. One of the more prescient comments by the author, "One of science's dirty little secrets is that many prominent scientists harbor remarkably postmodern sentiments." I like it when math and science are linked to mathematicians' and scientists' personalities. Maybe I'm just being a fluffy headed idiot for this. After a while, the scientists just sort of swirl together into a indistinct jumble, and I had to sort of force-march my way through it. But I think it was worthwhile just to get a rough overview of what's going on in the scientific world. Overall, I really enjoyed this book - it is a series of interviews with noted scientists & thinkers & covers a variety of scientific fields including cosmology, evolutionary biology, physics, neuroscience, etc. It is very accessible to non-scientists & makes some controversial claims. A good introduction to some of the most perplexing & exciting scientific problems scientists are grappling with these days. In support of a daring postulate, certain to enrage a myriad of scientists, the author harvested a cohort of interesting interviews that provide interesting perspectives. Given what’s at stake, one would have expected little support for such a subjective and aggressive proposition, but pessimists will be delighted to discover that they are in good company. Author contacted many scientists and introduced their view on the future of Science. Through he tried to say all kind of sciences has limitation but as expected, there's no conclusion. The book has been published over 10 years and most of the viewpoints are still valid, good to catch some idea over there. JOHN HORGAN is a science journalist and Director of the Center for Science Writings at the Stevens Institute of Technology, Hoboken, New Jersey. A former senior writer at Scientific American (1986-1997), he has also written for The New York Times, Time, Newsweek, The Washington Post, The Los Angeles Times, The New Republic, Slate, Discover, The London Times, The Times Literary Supplement, New Scie JOHN HORGAN is a science journalist and Director of the Center for Science Writings at the Stevens Institute of Technology, Hoboken, New Jersey. A former senior writer at Scientific American (1986-1997), he has also written for The New York Times, Time, Newsweek, The Washington Post, The Los Angeles Times, The New Republic, Slate, Discover, The London Times, The Times Literary Supplement, New Scientist, and other publications around the world. He blogs for the Center for Science Writings and for Bloggingheads.tv (see links at left).